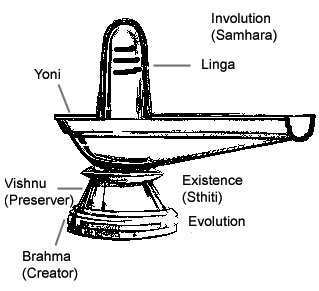 Shivalinga worship is ancient, original, prehistoric and not merely an abstract symbol. Many Saints and Heroes in Puranas worshipped Lingam made out of Clay, metal, copper, iron, silver, gold, mud, stone, precious gems, wood, butter, ice, earth or transitory materials such as made out of flowing river., and invoked Lord Shiva into it. We read from scriptures Arjuna fashioned a Shiva Lingam made out of clay. 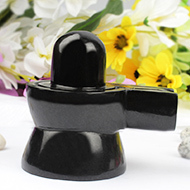 A transitory Shivalingam may be made of twelve different materials, such as sand, rice, cooked food, river clay, cow dung, butter, rudraksha seeds, ashes, sandalwood, darbha grass, a flower garland or molasses. This sends the message that God can be invoked and worshipped in any convenient form; the form is irrelevant, but the divine power that it represents is important. Legend talks about Parvati fashioned a Shiva Lingam to worship the Lord in Kanchipuram, while Lord Rama, due to delay by Lord Hanuman who was summoned to bring Shiva Lingams from Himalayas, made Shivalingam in sand and worshipped at Rameshwaram. This is known as Prithvilingam, denoting the primordial element earth. Some of the Shivalingams are Swayambus, appeared on its own, some of them are untouched by a chisel; there are rare Shivalingams in Pallava period bearing several stripes shaped, witnessed at Kailasanatha temple at Kanchipuram. As you may be aware, Shivalingam is generally circular based, a quadrangular receptacle. The pedestal is shrewdly shaped to drain off the water when ablutions are performed. This is the only God whose Form and Formless appear together. Shiva Lingam is in various shapes, 11 typed shapes, elliptical, aniconic image, with a circular base or Peetam. He is beyond all qualities of Forms and Formlessness, He appears in either form or Formless. 04. 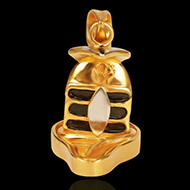 Padara Lingam: It is made of mercury and bestows inestimable fortune. 06. 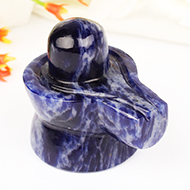 Ahasa Lingam: It is made of Vitroil of sulphate and relives one from the menace of enemies. 07. Seesa Lingam: It is made of Lead and makes the adorer invulnerable to foes. 09. Navaneetha Lingam: It is made of pure butter and confers fame and wealth. from untimely or accidental death. 13. Mouktika Lingam: It is made of Ashes obtained by burning pearls and confers auspiciousness and fortune. 15. Rajita Lingam: It is made of silver and confers fortune. 16. Pittala Linam or Kamsya Lingam: It is made of an alloy brass and bell metal and confers the release of soul from body. 17. Bhamsa Lingam: It is made of Ash and confers all desirable merits. 18. Guda Lingam or Sita Lingam: It is made of Jaggery or Sugar and confers blissful life when adored. 19. Vamsankura Lingam: It is made of tender leaves of bamboo, and confers a long line of genealogy. 20. Pishta Lingam: It is made of rice four and blesses the adorer with education. 21. Dahdhidhughda Lingam: It is made of Milk and Curd on separating the entire quantity of water, and blesses the adorer with property and happiness. 22. Dhanya Lingam: It is made of grain and blesses bumper crops to the adorer. 23. Phala Lingam: It is made of fruits and blesses the owner of orchards with good crops of fruits. 24. 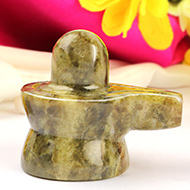 Dhatri Lingam: It is made of a kind of acid fruit - phyllanthus Emblica and bestows liberation. 25. Gandha Lingam: It is made of Chandanam (sandal wood paste), three parts of Kumkumam and two parts of musk. Size determines the quantity and cost to be put in but the ratio remains constant. If worship is made to this Lingam, one gets blessed with Shivasayujyamukti - merging Jeevatma with Paramatma when one is consciousness. The cycle of birth and death comes to an end. 26. Pushpa Lingam: This is made of various kinds of fresh, fragrant, multi-coloured pleasant flowers. It blessed the adorer with kingship and acquisition of land. 27. Gosakru Lingam: It is made of dung of brown coloured cow. The adorer will be blessed with wealth, if he worships that Lingam. 28. Valuka Lingam: It is made of fine sand and the worship confers the status of Vidhyakara, belonging to one of the denominations of worshipful angels, besides Shiva Sayujya Prapti. 29. Yavagodhumasali Lingam: It is made of rice, maize and wheat flour, and if adored, it confers Sntana Prapti (blessing of child) in addition to wealth. 30. Sitakhanda Lingam: It is made of Sugar candy and blesses the adorer with robust health and disease free easy life. 31. Lavana Lingam: It is made of salt mixed with the powder of Hartal and Trikatukala. I blesses the adorer with Vasikaranasakti -- the power that subdues other with the help of spells and charms. 32. Tilapista Lingam: It is made with the paste of Gingely seeds, the desires of the doer are fulfilled, if worshipped. Dear Rudra Center. I don't have job from a long time. After wearing 5 mukhi rudraksha mala from Nepal from Rudra Center. My confidence is increased. I am getting a job! After my sallery and some saving I will surely buy 14 mukhi rudraksha bracelet , 10 mukhi rudraksha bracelet and 8 mukhi rudraksha bracelet soon. And RRST recommendation from miss Neeta jee. Thank you for providing a very good service. I would like to purchase more things in the future. Thanks once again premanand for giving so good support.